The Samson juicer is a multi-purpose, single gear masticating juicer. It crushes, not chops, to extract juice. But it does much, much more than that. If you are looking for equipment that not only makes juice but a whole lot of other things, then this juicer will become your must-have kitchen tool. Quite honestly I would seriously miss my Samson juicer as it sits permanently out on my worktop as it’s used all the time. 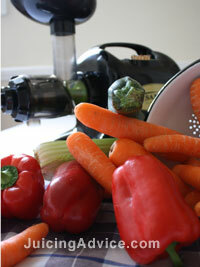 If you want to make vegetable juices, then the Samson juicer will make you very happy. Unlike many other juicers, this one handles leafy greens easily and efficiently. It also handles sprouts, wheatgrass, and even pine needles and aloe. Of course, you can also use any kind of fruit with the Samson juicer, so your mixing possibilities are endless. This juicer also functions as a chopper. You can mince onions, garlic, scallions, peppers and many other things, without ruining flavor or nutrition, for use in sauces, salsas and other recipes. And as if that wasn’t enough, you can switch out nozzles to make pasta, noodles, breads, nut butters and even alternative milks like soy, rice, and nut milks. In short, it juices pretty much anything, and the pulp that is left over is almost completely dry. The Samson juicer is easy to clean, with the auger, outer housing, screen, end cap and nozzle all going through the dishwasher with no difficulties, and can also be cleaned easily by hand. 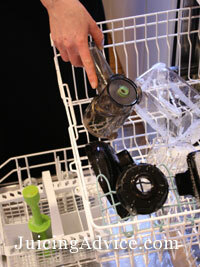 Here you can see me loading the parts into the dishwasher, but I have to say this juicer is so easy to clean that I often just wash it by hand. Believe me I’m no fan of washing up so it must be easy. You even get a handy cleanng brush to make life easy. The motor is powerful, but does not create a ton of heat that affects the nutritional content of your foods. The noise level is about the same as a regular food processor, so it is not overly loud. If you are serious about not only juicing but making most of your food from scratch, then this machine is a great investment for you. Because it has so many functions, you end up saving a ton of money over buying separate gadgets for each purpose. You also get the security of knowing that your pastas, butters, milks and other recipes are made with fresh, wholesome ingredients and have their full nutritional value intact. All in all, the Samson juicer is a truly versatile kitchen tool that not only makes your life in the kitchen easier, it also makes your life healthier too!